Pope Lucius I was a mid-third century pope who reigned for slightly less than a year during the Novatianist schism. He was born in Rome at an unknown date, and little is known about his family except his father's name, Porphyrianus. He was elected about June 25, 253 and died on March 4, 254. His election took place during the persecution which caused the banishment of his predecessor Pope Cornelius I. Lucius too was banished soon after his consecration, but succeeded in gaining permission to return. Lucius' brief papacy took place during the beginning stages of the Novatianist controversy, in which the Roman church and much of Christendom was divided over the question of whether those who committed apostasy under persecution could be forgiven, and under what terms. Lucius is referred to in several letters of St. Cyprian as having been in agreement with his predecessor Cornelius in preferring the milder view on allowing restoration of lapsed Christians who had repented of their apostasy. 1.2 Death as a martyr? Tradition claims that he was martyred in the persecution of Valerian, but as Valerian was reportedly tolerant of the Christian faith until well after Lucius' death, this seems unlikely. St. Lucius' feast day is on March 4. Very little is known of the early life of this pope before his elevation. According to the "Liber Pontificalis," he was Roman born, and his father's name was Porphyrianus. The persecution of the Church which had begun under Decius and continued under Trebonianus Gallus—during which Pope Cornelius had been banished—still went on at the beginning of Lucius' papacy, as did the Novatianist schism. Novatian maintained that not even bishops could grant remission for grave sins like murder, adultery, and apostasy, which could only be remitted at the Last Judgment. Especially contentious was the question of the status of Christians who had lapsed and engaged in pagan sacrifice during persecution. Cornelius and Lucius were of the party that held the view that even the most serious sins could be forgiven by the bishops, who had been given, with Saint Peter, the power of "binding and loosing" without restriction. Cornelius' election in 251 was supported by the future Saint Cyprian of Carthage. However, the stricter party had favored Novatian, who was consecrated as bishop of Rome in the same year. He thus became one of the first "anti-popes." Cyprian of Carthage provides some of the few details known of Lucius' papacy. Beloved Brother, only a short time ago we offered you our congratulations, when in exalting you to govern His Church, God graciously bestowed upon you the twofold glory of confessor and bishop. Again we congratulate you, your companions, and the whole congregation, in that, owing to the kind and mighty protection of our Lord, He has led you back with praise and glory to His own, so that the flock can again receive its shepherd, the ship her pilot, and the people a director to govern them and to show openly that it was God's disposition that He permitted your banishment, not that the bishop who had been expelled should be deprived of his church, but rather that he might return to his church with greater authority. Cyprian continues, alluding to the three young Hebrew men delivered from the fiery furnace, arguing that Lucius' return from exile by no means lessened the glory of his status as a confessor. Moreover, in Cyprian's view, the persecution showed the identity of the true Church. Cyprian asserts to Lucius that God, by means of persecution, sought "to bring the heretics to shame and to silence them," and thus to prove who the Church was. If it is the Novatianists to whom he refers as heretics, it is not clear how they are put to shame, for they were even more adamant confessors (willing to face martyrdom rather than deny their faith) than the moderate Christians such as Lucius. Novatian himself would later reportedly die as a martyr. Cyprian specifically mentions the issue of the "one bishop chosen by God's dispensation," and the "true presbyters" bound up with the bishop in the glory of the priesthood. He speaks also of the "real people of Christ," united to His flock by a special love. These he says, are those who have been oppressed by their enemies. In conclusion he describes the joy of Christian Rome on the return of its shepherd, Lucius. In the matter of the restoration of the "lapsi" (fallen-away Christians who had cooperated with the state), Lucius himself seems to have adhered to the generous principles of Cornelius. According to the testimony of Cyprian, contained in a letter to Pope Stephen I (ep. 66), Lucius had expressed his opinions in writing. Cyprian says: "They (the confessors Lucius and Cornelius), filled with the spirit of the Lord and confirmed in glorious martyrdom, judged that pardon ought to be given to the lapsi, and signified in their letters that, when these had done penance, they were not to be denied the enjoyment of communion and reconciliation." Lucius died on either March 4 or March 5, 254. A likely explanation for the confusion of dates is that he died on the former and was buried on the latter. According to the "Liber Pontificalis" Lucius died a martyr's death when he was beheaded in the time of Valerian. However this testimony is doubted even by Catholic sources. Moreover, the church historian Eusebius maintains (Hist. Eccl., VII, 10) that Valerian was favorable to the Christians in the early part of his reign. The emperor's first persecution edict appeared only in 257, several years after Lucius' death. It is true that Cyprian in his letter to Stephen (Epistle 66) gives Lucius, as well as Cornelius, the honorary title of martyr: "for the glorious memory of our predecessors the blessed martyrs Cornelius and Lucius is to be preserved." However, it was sometimes that case that those who had died in exile (like Cornelius) or those who suffered for their faith but did not die (like Lucius) were called martyrs and honored as such after their death. In the Roman calendar of feasts of the Chronograph of 35, Lucius is mentioned in the Depositio episcoporum (list of bishops) and not under the heading of Depositio martyrum (list of martyrs). His memory was, nevertheless, particularly honored, as is clear from the appearance of his name in the Martyrologium Hieronymianum. 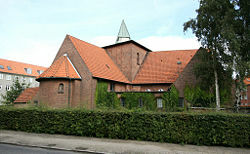 Ansgar Kirke in Copenhagen, where Saint Lucius head is traditionally believed to be housed. The report of the Liber Pontificalis that Lucius, as he was being led to death, gave the archdeacon Stephen power over the Church, is probably a fabrication, since Lucius' martyrdom itself appears to be fictional. It is indeed a fact, however, that Stephen I succeeded him as pope. Lucius was buried in a compartment of the papal vault in the catacombs of St. Callistus. The excavation of the vault discovered a large fragment of the original epitaph, which only gives the pope's name in Greek: LOUKIS. The relics of the saint were transferred by Pope Paul I (757-767) to the church of San Silvestro in Capite, and/or by Pope Paschal I (817-824) to the Basilica of St. Praxedes. The saint's head is supposedly preserved in a reliquary in St. Ansgar Catholic Church in Copenhagen, Denmark. This relic was reportedly brought to Roskilde around the year 1100, after St. Lucius had been declared patron of the Danish region of Zealand. Lucius' head is among the few relics to have survived the Reformation in Denmark. The author of the "Liber Pontificalis" ascribed to Lucius a decree, according to which two priests and three deacons must always accompany the bishop to bear witness to his virtuous life. Such a measure might have been necessary under certain conditions at a later period. However, in Lucius's time it would have been an impractical use of the church's limited number of clergy. The feast of St. Lucius is held on March 4. ↑ Cited in J.P. Kirsch, "Pope St. Lucius I," The Catholic Encyclopedia, www.newadvent.org. Retrieved June 12, 2008. This article incorporates text from the Encyclopædia Britannica Eleventh Edition, a publication now in the public domain. It also incorporates text from the public domain Catholic Encyclopedia (1913). All links retrieved August 21, 2014. Epistles of Saint Cyprian www.newadvent.org. History of "Pope Lucius I"